So Russell just came in and threw grapes at us. Literally. 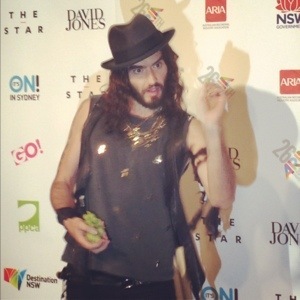 Everyone’s yelling “Russell Russell look over here, look over here!” And he just pegs grapes. It was quite funny. A photographer made a joke and said “that was ‘grape’ photo Russ”. It was totally excellent. Right on the money. Russell laughed, I laughed, we all laughed. I was so proud of Australia. Go us. He came and spoke to us about how we all live in a vortex. I didn’t really get what he was on about. I think it has something to do with the matrix. No idea. He’s a rambler all right. I’ll put a video up about it later. Not right now. I’m very busy. Writing this and eating grapes off the floor. He told us all about his day. About how he was in the carpark, saw a scary bird, walked down a long hallway, then BOOM now he was here!! He said he had a lovely day. So that’s nice. He also said he wants to hug a koala, eat oysters and sleep with lots of beautiful Australian women. There were cute giggles from many a female in the room. He looked pretty cool actually. All leathery and stuff. Not really my style but cool none the less. But then again, I am in a ball dress that’s tucked into my undies. So what do I know. Russell Brand ladies and gentlemen!! What a man! What a confusing ridiculous man!